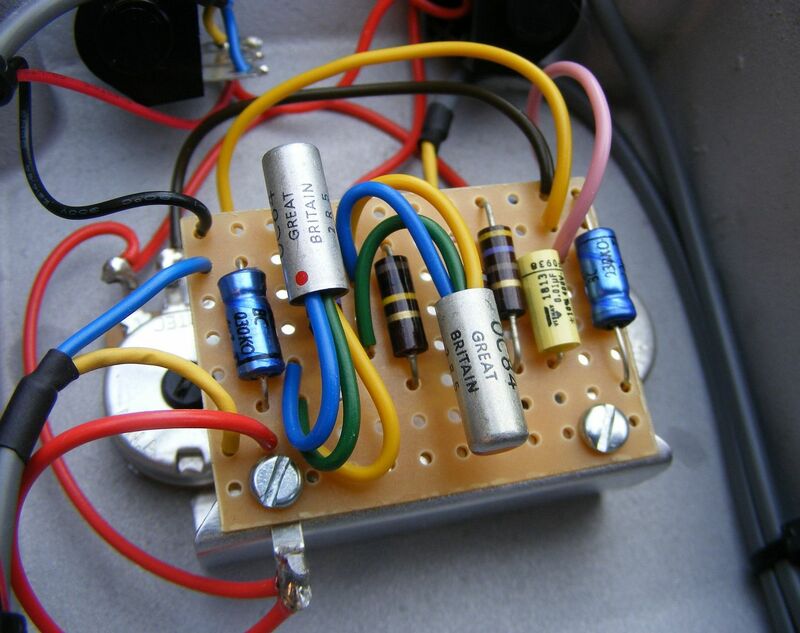 The first commercially made fuzz box to hit the UK market was the golden coloured, wedge shaped; three transistorised Gary Hurst designed Tone Bender. The Tone Bender was released in September 1965 and sold for 14 guineas, approximately £185 in today’s worth, it was advertised via several adverts published in Beat Instrumental magazine and sold primarily from the Musical Exchange branch of stores in the London area. 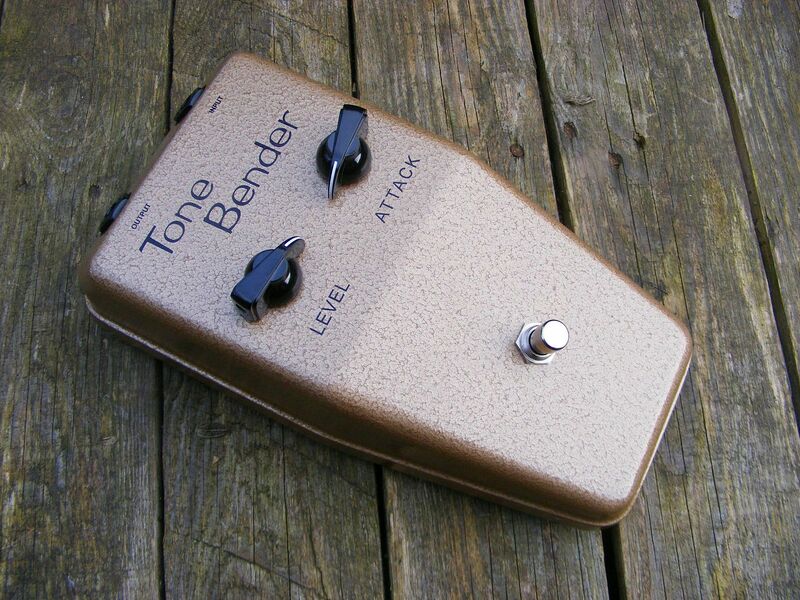 The Tone Bender was a big hit and quickly drew big name players to a growing rank of users. The Yardbirds, The Who, The Pretty Things, The Merseybeats, The Ivy League and a rather popular band from Liverpool called the Beatles were among users of the Tone Bender. Guitar player with a Hull based band called the Rats also used this original Tone Bender as his primary fuzz sound for many years. This Guitar player was Mick Ronson who as we know went on to play lead guitar along side a certain David Bowie. This first incarnation of the Tone Bender was only made for a relativity short time period before the design of the pedal was significantly changed. Following the success of this first Tone Bender, which we will refer to as the MKI, it was clear that the design of the pedal needed to be geared towards being a more readily produced item. Early in 1966 a new improved Tone Bender arrived on the scene, this version of the Tone Bender has become known as the MKI.5. This new design was much more modern & futuristic in appearance and was also more ergonomic in its aesthetics, more space ship like in appearance than the tank like appearance of the MKI. The new improved Tone Bender enclosure was manufactured using a sand casting process and was finished in a silver/grey hammertone paint. 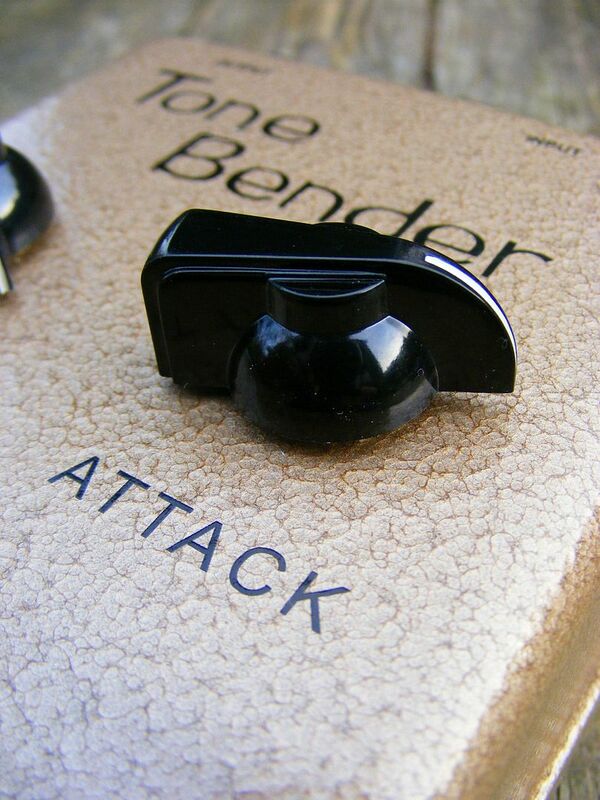 The new Tone Bender was, like its predecessor, named only as a 'Tone Bender'. The silk screening on the enclosure only featured the pedals name; the labelling for the controls and the input & output sockets, no company information was featured. This I find of great interest as the final version of the MKI did feature the company silk screening of 'Sola Sounds Ltd' and was sold as a Sola Sound product, the exclusion of the name on the MKI.5 is somewhat of a mystery to me. Theories for the reasons why include the pedal being designed as such that it could be sold to other retailers or that it was actually made along side the Tone Bender Professional MKII as a cheaper alternative. The internal construction style of the MKI.5 is of the same style that followed through into the build technique of the MKII’s. The electronic components were loaded onto a brown coloured compressed fibre piece of stripboard (sometimes referred to as Veroboard)that was then mounted via two pan head screws onto a folded aluminium bracket which in turn was held in place by the control pots. This mounting bracket also acted as a grounding point for the whole circuit. The MKI.5 utilised isolated jack sockets as to avoid ground loops, a feature used on all Tone Benders and most other quality British made effect pedals from the 1960’s. A technique unfortunately that is seldom used today. All the early Tone Benders, right up too the introduction of the MKIII, also relied heavily on the use of shielded cabling throughout. Again a very good construction technique and yet again little seen in use today. Interesting side note, true bypass switching that is often seen as a modern feature to 'boutique' builders was actually first seen used in the Tone Bender MKI. The earliest MKI.5 Tone Bender I seen featured two IMPEX S3-1T Germanium transistors. Possibly have been prototype unit? Commonly the MKI.5 along with a large percentage of MKII Tone Benders used the British made Mullard OC75’s. The two transistor arrangement of this type of circuit is called a voltage feedback biasing circuit. Interestingly, several fuzz boxes that first made their appearance in the year 1966 used this very same set-up. The Arbiter Fuzz Face, the Vox Tone Bender, Vox Distortion Booster and the Sola Sound made Tone Bender MKI.5. Possibly a happy coincidence? but more likely inspired by the popularity of the originator. There are several view points to this story and the whole 'which came first' scenario is a little hazy to say the least and has been debated for several years by fuzz freaks & pedal collectors alike. How would I hear one today? Here at D*A*M we produce a genuine reproduction Tone Bender MKI.5 for Sola Sound of London. This pedal is an official recreation of the original 1960's made two transistor Tone Bender. This fuzz box will give you a genuine experience of that original Sola Sound made pedal that was produced some 45 years ago. We selected to use genuine Mullard stamped devices for this project. Mullard OC84's to be exact. These offer the player greater benefits of sonic control giving you a slightly more refined and dynamic tone which I feel makes it a more flexible and useable pedal. You still get all that nice chunky fuzz tone at full Attack, as you would with a OC75 loaded pedal, but without any overly gated or excessive decay. I've been making Tone Benders since 2002AD I have studded a large percentage of the vintage units that survive to this day. The Tone Benders I make for Sola Sound are made with the greatest care and the highest standards possible and represent the culmination of 9 years of study and research. If you are interested in this project please contact the fine upstanding gents at Macari's in London. Legal Disclaimer: 'Tone Bender' is a registered trade mark and owned by the Macari's (AKA Sola Sound Ltd) of London. It is a legal infringement of this right to use the term Tone Bender in any unauthorised manner. Beware of bootlegs and cheap imitations. Only true Tone Bender's are made by and for Sola Sound Ltd, London.